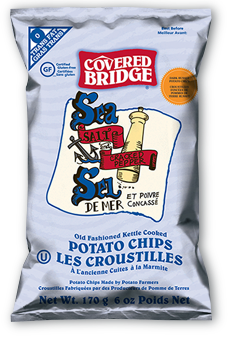 If Regular Chips smash and mush up and the very best Hand Cooked Kettle Chips mulch at an even pace from hard a brittle to firm and rigid, these trod a fine line between both. There was never a mush stage, but neither was there a brittle and sharp munch. It may be the Dark Russet Potatoes that helped create these, but they really were exciting looking Potato Chips. They were gnarly, curled and in some cases folded. There were heavy and small oil boils and also a plentiful supply of Black Pepper seasoning. These really should be the easiest Chips for any company to get right. There are effectively four ingredients: Oil, Potatoes, Salt and Pepper. The effort is in balancing the Salt and Pepper. While these were tasty and effective, there was a little more Pepper than Salt which meant the balance was slightly skewed. Maybe it is welcome as Salty Potato really has not needed much help in the past.